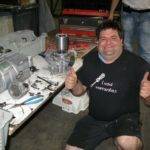 Machinery designer and die maker by day, mad scientist the rest of the time Machinery designer and die maker by day, mad scientist the rest of the time - HGR Inc. I heard of HGR Industrial Surplus mainly from word of mouth. I used to deal with McKean Machinery where my boss sent me until it was bought by a New York firm and they got rid of the odds and end. As a result, they lost some customers. Many people that buy the little stuff at HGR see the large ticket items and send others they know who need these items. Employees left McKean to start HGR; so, it was a natural transition. You’ll see some of the things I’ve bought at HGR mentioned in the story below. 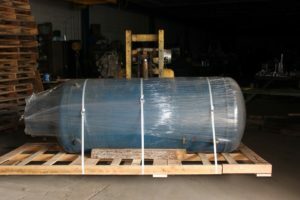 Recently, my workplace bought a MIG welder at HGR for the construction of Dan T. Moore Company’s plastic extrusion and rolling machine that is the size of a room. It’s for extruding plastic and rolling it into film. What they had at the welding supply store was not what we needed. We required a 100-percent duty cycle machine that could run all day long and found one at HGR. 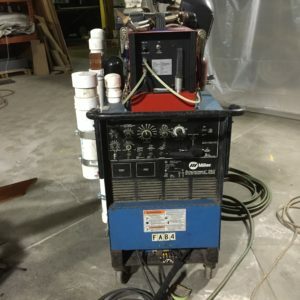 I’m a die maker and do die repair, hydraulics, welding, machine tool wiring, basically an industrial maintenance technician who handles anything electrical, hydraulic and mechanical. I work for Mahar Spar Industries. A spar is the main strut in a sailboat, and the founder’s name is Mike Mahar. He started out making spars and sailboat masts in his garage in his spare time, and the business evolved from that point. Many ask me the origin of that unique name. I’ve been there for 20 years, and prior to that I was at NASA Glenn Research Center doing composite metallurgy research for jet engine applications and at the same time on a joint project working at Cleveland State University doing metallurgical research in the chemical engineering department where I built the metallurgy lab. 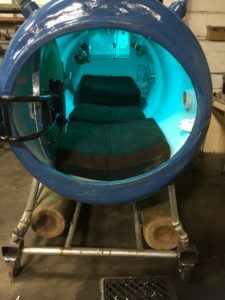 One of the items that I am proud of that mostly came from HGR is a hyperbaric chamber. 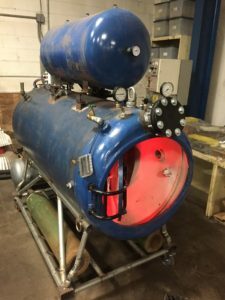 My doctor said that it would be helpful for my health to use one, but medical insurance wouldn’t cover treatments for this off-label use that was proposed; so, I came to HGR and built my own from used air compressor parts for pennies on the dollar. A new one for medical purposes costs $75,000. They usually are purchased by hospitals and medical facilities to treat diabetic patients with wounds that won’t heal, necrotizing fasciitis, carbon monoxide and cyanide poisoning, and scuba diving accidents and are used in clinical studies and trials to increase brain function in people with autism and a few other applications. I am a diver, but luckily haven’t had an accident yet and have not had to use it for that purpose. It cost me about $4,000 to build mine. By dumb luck I found a medical air compressor at HGR normally used in a dental office for the chamber along with a $1,200 medical oxygen regulator for $15 that just needed to be rebuilt. It basically functions as an isolation chamber, and you breathe pure oxygen through a mask as the oxygen regulator increases its output by using the chamber pressure as a reference point. We do projects for the Dan T. Moore Company, who also is an HGR customer. Dan believes Cleveland doesn’t have enough bike trails; so, he dropped off a small bulldozer and wanted it converted into a bike trail cutting machine. 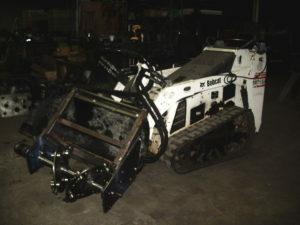 With our custom attachment it became something that looked like a bulldozer, meat grinder, snow blower hybrid. Some of the hydraulic parts came from HGR. He also wanted to build a steel mill in Bolivia at one point in the past, and we were doing a mockup of the process. We needed a large blower. His people were going everywhere else looking for stuff. I found one at HGR that looked and roared like a jet engine that was 125hp, and it worked great! Additionally, I do maintenance work at a bakery that has a huge electric oven made in Italy that you can’t get parts for; so, you have to manufacture the parts yourself. 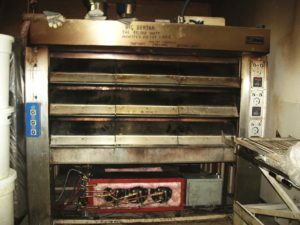 Its internal electric flash boiler caramelizes the bread giving it that hard crust by explosively filling the deck with wet steam at the beginning of each bake cycle. The original boiler could not keep up and self-destructed. I copied the basic design with some improvements and made one five times larger. Some of its parts came from HGR. I also work for Whitney Stained Glass Studio doing artistic metalwork restoration and conservation along with fabricating window frames. 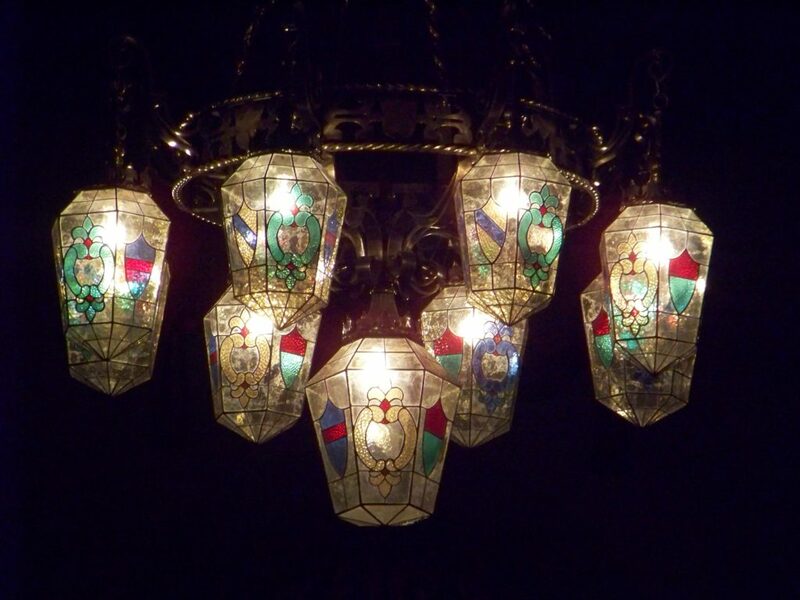 Projects include the windows at Stan Hywet Hall and the restoration of the outside stained glass lamps for St. James Catholic Church in Lakewood after a bird built a nest in it. The owner turned it on, and it caught on fire, which melted the solder. I had to strip the patina to fix it, which is considered a no no because it was covered in plastic. I said, “Watch me age this thing 100 years in minutes.” I stuck it in bleach and salt water and put power to it like in a plating operation and totally corroded the thing in 40 minutes. To put the hyperbaric chamber together, I needed to purchase a large TIG stick welder. I found a Miller at HGR for a fraction of the cost of a new one. It didn’t work and needed a little TLC, but if I buy it and it doesn’t work out it’s nice to know I can return it within 30 days. I got it for the cost of the copper scrap, gave it a bath, found a simple control issue and brought it back from the dead. It pulls 105 amps at 240 when I’m welding heavy aluminum. I would turn it on and watch the neighbor’s lights dim. Is the problem 2B solved or not to be? That’s the question. A trip down HGR’s Aisle 2B for some capacitors solved the problem, and the neighbor’s lights didn’t dim anymore. The effect is like pouring a glass of beer. You want the beer but not the foam. These capacitors get rid of the electrical equivalent of the foam. You know the big speaker in the opening scene of Back to the Future? I said to a friend, “Cool, let’s build one.” A 5-hp stereo system was born! 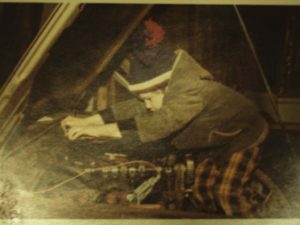 The neighbor would call me for requests when I fired it up in the summer while he was cutting his lawn as long as I played his stuff. The neighbors didn’t like heavy metal, and that’s when the heavy metal station Z Rock was on the air and when I hit the heavy-metal stage in my development. Building a fire-breathing dragon for the play “Reluctant Dragon” at a children’s theater in 1985 was a blast. When I adapted an old CO2 fire extinguisher and put red lights in the mouth and eyes, it worked first rate. My electronics business in my parent’s basement when I was 10 or 11 aided in paying for this lunacy. Cleveland Heights High Schools auditorium has huge 300-pound chandeliers. One of them dropped about 35 feet while they were trying to change the light bulbs and smashed into smithereens — a mangled, twisted mess. 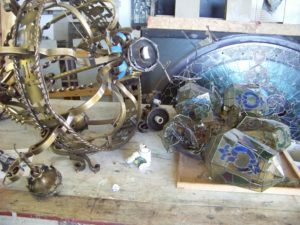 Redoing all the artistic metal work was a challenge while many others at Whitney Stained Glass restored the stained glass globes. He fixed the TV but left back off. One day, while I was watching it, the picture got odd. I realized the cat was inside. When I went to grab the cat so she would not get hurt, she jumped out and my hands landed on the flyback transformer and lit up blue. Afterward, I felt like lightning had hit me. I woke 15 minutes later across the room and had a revelation — that’s why it’s called a flyback transformer because when you grab one that is what you do! Another time, as a little kid in the car at the gas station, I asked my mom why the man had a garden hose and was putting water in the car. Mom said it was gas but she wished it was water because it’s cheaper. At home, I put five gallons of water in the car to save mom money after I noticed the spout on the lawn mower gas can fit the end of the garden hose. We ended up stranded the next time we drove it. I’ve had eight various experiments with electricity. It’s amazing that I’m still alive. I wondered how a vacuum cleaner worked. My dad explained the process of how it worked starting with electrons moving in the cord. I had to find out what an electron looked like; so, I opened up paper clips and was determined to go to the outlet and pull one out. I had two paper clips, one in each side. When they touched, there was a fiery explosion that burned my hands. I got to see a lot of electrons! Love the interview, Christopher! The humor is indicative of your fun personality and the article shows your mechanical genius. How wonderful that HGR has aided in your inventions. Keep experimenting!